The contemporary Eastern Caribbean maritime seascape is the subject of a scramble for registering various conflicting claims and counter claims that can result in a hostile and mad grab for the potentially hydrocarbon yielding oceans having regard to the escalating price of oil on the world market. The 200-mile distance- based relatively new regime of the Exclusive Economic Zone (EEZ) that is being projected by Barbados as a harbinger of windfall maritime space has introduced complex legal challenges in rationalizing the over-lapping and indeed some superior maritime claims declared hitherto by Barbados, Trinidad and Tobago, Venezuela and to a lesser extent the mainland Republic of Guyana. It is to be noted that the concept of the regime of the continental shelf came into being in February 1942. In the current imbroglio, T&T's and Venezuelan claims to the continental shelf reinforced by equitable principles of delimitation are coming against the 200-mile EEZ distance claims and the equidistance method of delimitation advanced by both Guyana and Barbados. Great Britain and Venezuela concluded the 1942 Gulf of Paria Treaty that divided the seabed areas located beyond the then 3-mile territorial sea in the intervening Gulf of Paria between themselves. This is indeed the first maritime C/S claim and boundary in any part of the world. 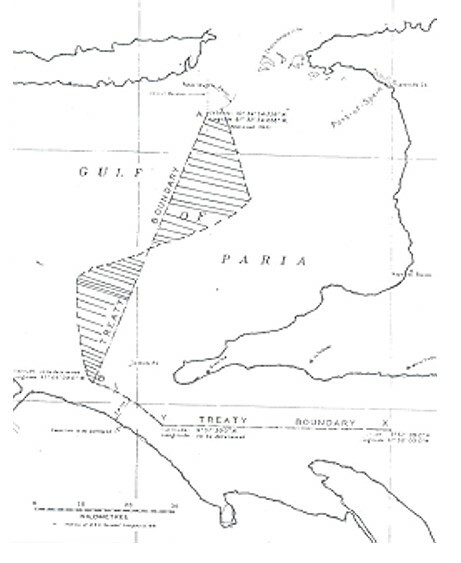 Her Majesty annexed her part of the Gulf and attached it as part of the territory of Trinidad and Tobago for administrative purposes via The Gulf of Paria Annexation Order (see boundary chart attached below). The Truman Proclamation of 1945 issued by the President of the United States served as the trigger for generating overwhelming international legitimacy and increasing momentum to a galloping series of consequential claims on the continental shelf by the international community of states. While this widespread state practice was integrated into and constituted the underpinnings of the international 1958 Geneva Convention on the Continental Shelf the regime of the EEZ although also a norm of customary international law is of recent vintage. The EEZ came into being through the provisions of the 1982 United Nations Convention on the Law of the Sea. It was based on a widespread uniform and consistent state practice that emerged among notably among the countries of Latin America who issued a variety of 200 miles claims. 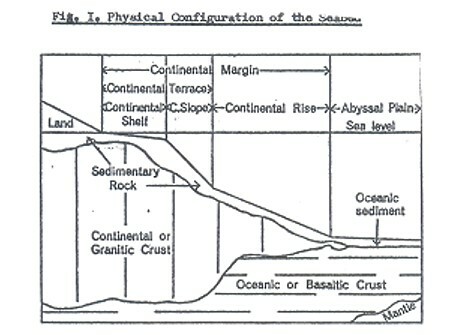 The concept of the continental shelf is based on the existence of a continuous, unbroken and established physical and geo-morphological nexus and link that exists between the claimant coastal state's land territory and its physical prolongation or extension to the off-shore seabed and subsoil. The coastal state exercises a functional and exclusive economic jurisdiction, that is to say sovereign rights over sedentary living and non-living resources present in its continental shelf. The limits of the jurisdiction of the coastal state in 1958 onwards to 1981 extended as far seawards to the point where the coastal state can demonstrate empirical evidence of potential usage or exploitability beyond the 200-metre isobath. In the absence of evidence of exploitability the 200 metres isobath marked the seaward extent of the shelf. The crux of the maritime delimitational and jurisdictional problems in the Eastern Caribbean arises principally from the fact that Barbados is claiming to exercise preferential 200-mile EEZ rights jurisdiction over the waters, seabed and subsoil of maritime areas that are included within the ambit of a 200-mile distance arc that turns on and is drawn from Kitridge Point in Barbados. This arc and the shaded maritime EEZ areas are shown in the chart below. 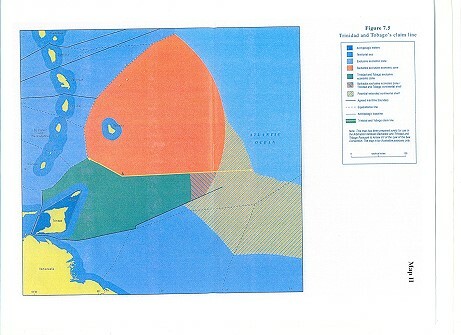 That chart shows that Barbados has claimed exclusive hydrocarbon rights on the seabed and subsoil of the maritime areas that are located eastwards of Points 2 to 11 of the TT/Barbados boundary as well as south of the 1990 TT/Venezuela boundary. These said seabed and subsoil areas now claimed by Barbados under its EEZ regime are also "ipso facto et ab initio" appertaining to both T&T and Venezuela since 1990 under what I would term the superior regime of the continental shelf based on both distance and geomorphology criteria. Which is the superior claim? The burning question to be addressed and resolved among the parties and if not, by submission to third party judicial intervention is which of the competing and overlapping claims made respectively hitherto by Barbados, T&T and Venezuela take precedence over the other? Is it one based primarily on the 200-mile distance criterion of the EEZ that also extends to the seabed and subsoil or the ones founded on and legitimized by the earlier concept of the continental shelf regime that may extend beyond 200 miles from say T&T and Venezuela but may also be within the 200 miles from Barbados and in which there is physical nexus with the land? Can one state legitimately claim the seabed and another the superjacent waters? Barbados is conducting its foreign maritime relations in the Eastern Caribbean under the misleading assumption and belief that the EEZ distance criterion regime of 200 nautical miles takes precedence over and supersedes the distance, geo-morphological and geological criteria of the continental shelf regime in determining its maritime boundaries and justifying its claims. Barbados cares nothing about the fact that it has no natural prolongation of its land territory extending beyond 40 miles from its south coast that marks the foot of the slope. It may claim a 200-mile continental shelf by the distance criteria but it may no go further than 200 miles because it does not meet the geological criteria. Has the concept of the continental shelf based on the new distance criterion extending short of as well as beyond 200-miles also matured into a norm of customary international law and therefore equal in legal status to the regime of the EEZ? That is not an easy question that is within the exclusive remit of and to be decided competently by the Commission on the Limits of the Continental Shelf. It raises fundamental legal issues that are separate and distinct from the application of the distance, geological and geo-morphological criteria that the Commission is authorized to apply in accordance with Article 76 in recommending to the coastal states concerned the limits to be observed to demarcate the limits between national jurisdiction ( the seaward limits of a state's continental shelf or EEZ) and international jurisdiction ( the beginning of the area under the jurisdiction of The International Seabed Authority). The unraveling of the daunting legal complexity of this matter has to be referred to any of the designated judicial organs ( Article 287(1) that are authorized to conduct an interpretation and application of the provisions of the Law of the Sea Convention before any action is undertaken with respect to the legitimizing and finalization of the claim of Barbados to exercise sovereign rights over resources located beyond 200 miles to 350 miles by the Commission on the Limits of the Continental Shelf. It is geologically irrefutable and can be verified from empirical geologic data that the seabed and subsoil areas being claimed by Barbados located beyond 40 miles from its southern coasts as part of its 200-mile EEZ/continental shelf as well as those maritime areas extending beyond 200 miles that it is claiming do not constitute the natural geological prolongation of the land mass of Barbados into and under the sea in the Atlantic Ocean. The bulk of the maritime areas (ECS) extending beyond 200 miles that is claimed by Barbados and submitted for verification before the CLCS, having conspired with the Arbitral Tribunal to zone-lock and shelf-lock T&T at Point 11, is really the natural geological prolongation of both T&T and Venezuela as physical extensions of the South American continental shelf. "...Barbados does not sit on the continental shelf of South America. It is essentially a bump raised as a consequence of the collision of the Caribbean and Atlantic Plates, which also gave rise to the chain of islands to the North. It does not have what is called an island shelf, a narrow platform of relatively shallow seabed around it, particularly to its north, which plunges into abyssal depths..."
The net result of the contaminated miscarriage of justice inflicted upon T&T by the boundary fixed by the Judgment of the Tribunal is that Barbados, having used the distance criteria of the EEZ/CS to encroach on and appropriate some areas of the natural geological prolongation of T&T that protrude over and are also located on the Barbados side of the 2006 EEZ boundary including northwards of Point 11, will now use this appropriated geological platform from T&T as the enabling vehicle to propel itself into the extended Atlantic continental shelf (belonging to T&T and Venezuela) towards the edge on the continental margin that is illustrated in the next chart below. This is another miscarriage of justice on top of the Judgment. That would appear to be the basis of a further maritime boundary dispute to be settled between the countries if it can be demonstrated convincingly that the principle of natural prolongation takes precedence in negotiating competing claims beyond the 200 miles of T&T but within the 200 miles EEZ claim of Barbados. Point 11 is 219 miles from Point Galeota. That would appear to be the only window of opportunity for a "salida" into the Atlantic that may be open to both T&T and Venezuela at present.